When Lee Lee first approached us about Debris I got really excited about the ecology and the message of her international project. Aiming to teach about the global impacts of single use plastic on not only the environment but on us as humans, her logic is to bring the message to youth. They are the young questioning and open minds of the future who will help us to unveil just how harshly this material is affecting everything. Lee Lee collects images of the pieces that have been created and continues to set up interactive installations at galleries and educational institutions around the world to bring awareness to the cause. 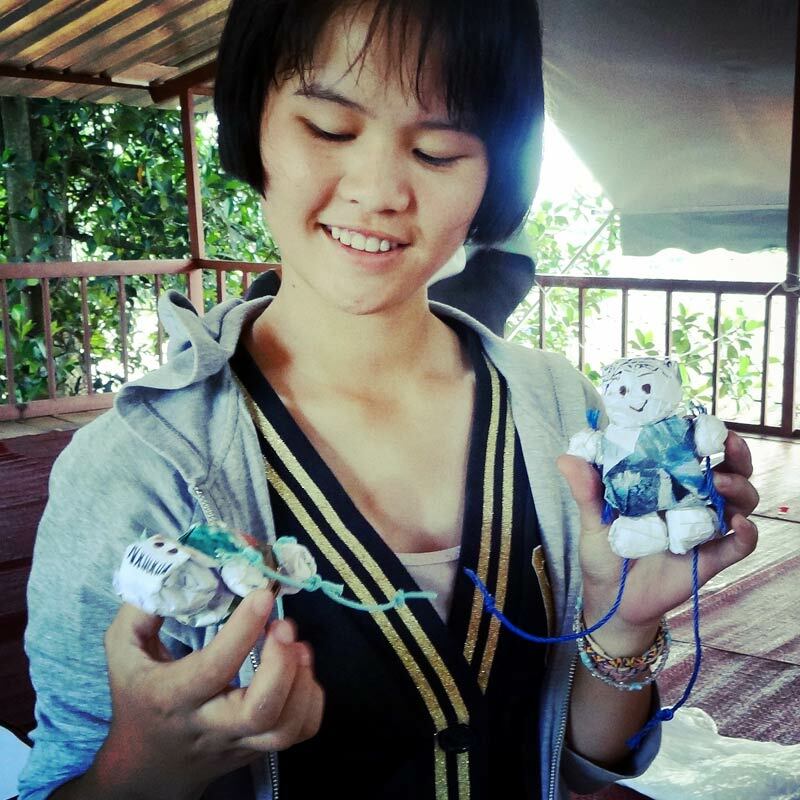 While she was doing a residency in Chiang Mai, we got the chance to meet with her and learn more about Debris. During our first workshop with her, we also learned that she keeps the art making process very open ended. She first teaches about how marine life are suffering from ingesting toxins from the plastic, which then translates to chemical burdens in land dwelling animals and humans. Once the participants have understood this, she asks them to create a piece of art inspired by these teachings. 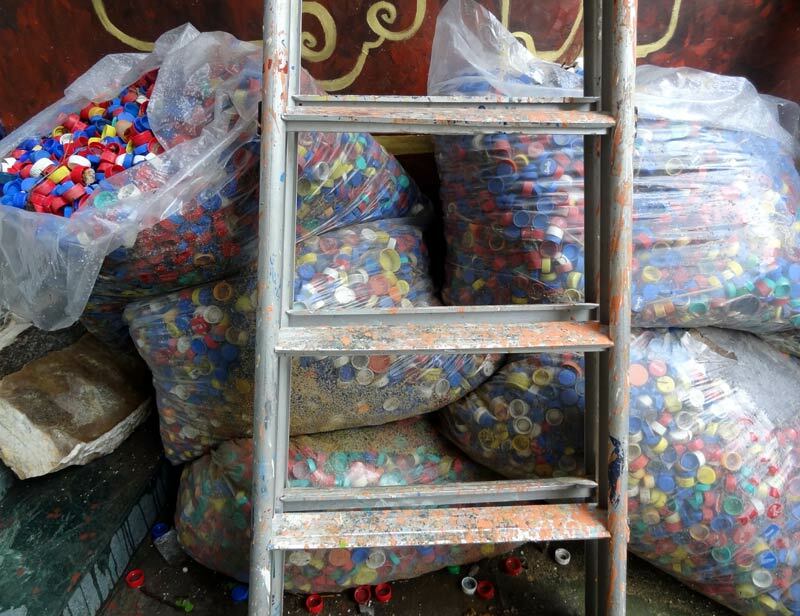 She brings along bottle caps, straws, and other forms of plastic that she has collected in Chiang Mai, making the project very localized. Usually, she says, she allows the student to collect used plastic from their homes during a specific time period for them to really understand the amount of plastic that we actually use. Another important material she encourages for this project is fused plastic bags that make a stronger plastic and can look quite beautiful. She teaches older students how this process works and encourages them to use their creativity to find beauty in this so called waste. 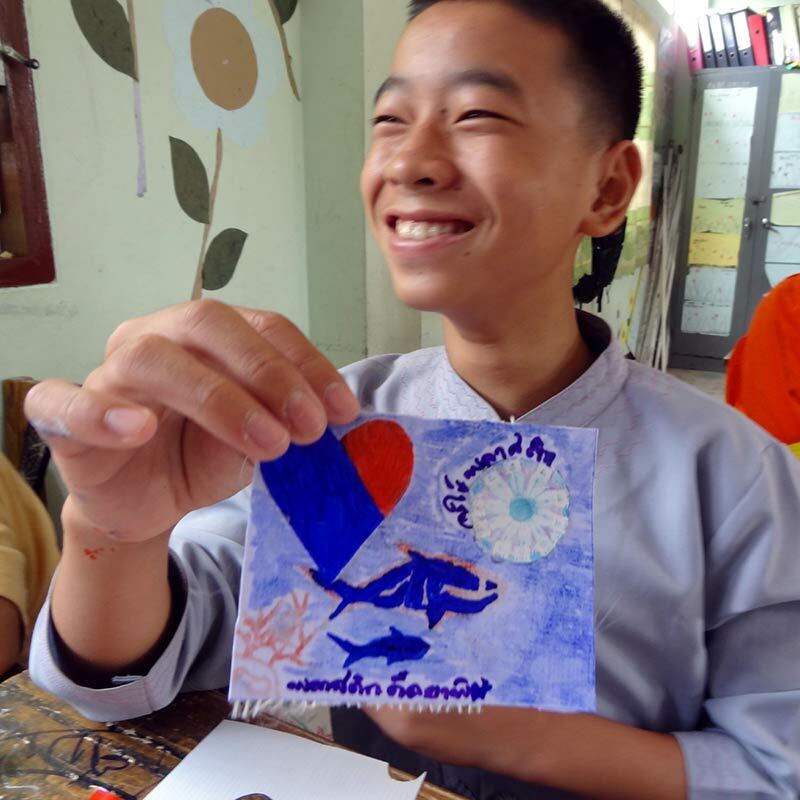 After collaborating with Lee Lee at Wat Meun Neun Kong during our weekly visit to host a drop in after school arts class, we could see that this project could raise a lot of awareness about the use of plastic. I come from North America, where plastic usage is beginning to be understood and it’s common for people to use their own bags for groceries, and to use a stronger bottle to carry water instead of buying something off the shelf, among other things. But in places like Thailand there isn’t a lot of awareness about the usage of plastic and every trip to a 7/11 or a street food vendor means you’ll collect more than one plastic bag before getting the chance to say you don’t want a bag in the first place, not to mention all the wrapping and packaging of each item. The awareness just isn’t there. So we tried to bring the project to all of the public schools we work with in Chiang Mai including Wat Pa Pao, Wat Kuang Sing, and Wat Ku Kam hoping that we could bring some awareness to them in a creative way. The students all responded very positively to the process. They seemed to get inspiration from all the plastic and focused intently on their pieces. Because of the ever changing nature of the ocean, Lee Lee allows the students to combine different materials in different ways without glueing them down. We tried to be quick with our cameras to catch some of the interesting creations that the students experimented with. Once we had reached out to the students, we sent the photos to Lee Lee for her to rework them. 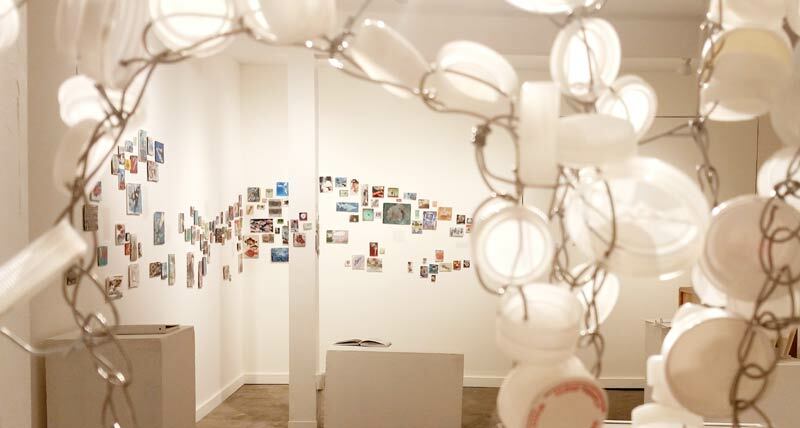 We had the opportunity to include the Debris project in our annual exhibition so we showcased the photos outside of a large metal framed bottle filled with plastic (all collected from what we used at our office). This was such a collaborative piece that so many people got to be a part of and we are so happy to have been able to bring this project to the community in such a way. We also got the chance to work with John and the kids from the Stratton ABC foundation who were working on their own very special version of the project. The kids came up with the idea to create a plastic demon made solely out of plastic. When we arrived to give them a hand they were just finishing this step and were looking for ways to keep him strong and supported. We added some wire to secure his body to a chair and his head to his body and when we returned the second time, Chevy the demon had skin and a face and he was alive and well. We all painted his environment outside on one of the foundation’s walls where he is emerging from the flames of a plastic landfill, ready to warn us about the dangers of plastic. A big thank you to Lee Lee for reaching out to us here in Chiang Mai. We hope the project continues to educate and inspire people to make a change, daily. Reflections on the programming maintained by Art Relief International in Chiang Mai Thailand may be found on their volunteer blog. Creating works in a circle at Wat Muen Ngen Kong during an after school program. The materials were gathered on the streets of Chiang Mai and combined with existing works from the Debris Project. “Plastic is toxic” A student shows off his work at the Wat Pa Pao Debris workshop. It is said that Thai people touch the earth lightly, like butterflies. Indeed as a visitor, I was greeted with nothing but the utmost of grace. As I explored the corners of Chiang Mai, however, I noticed a flurry of plastic bags fluttering in the wind like butterfly wings. This material is anything but light in its environmental impact. I was in Thailand specifically looking at the way plastic is used and misused as part of the Debris Project, a collaborative art installation built from an international response to the health and environmental impacts of plastic. With the recognition that plastic is an important material because we don’t have the natural resources to support out population without it, we focus on the environmental havoc wreaked by single use plastic. As a resident at the Rumpueng Community Arts Space, I had the opportunity to connect with local creatives and work with an array of students through the efforts of Katie Jade Hawker and Pitchaya at Surface Arts as part of their residency program which hosted artists making collaborative works. There was an installation of the artwork made in Thailand at the Rumpueng gallery space from 23-30 October. The project has been carried on by Art Relief International, who hosted an installation of the project as a culmination of their participation at Thapae East on November 6th. A primary focus of the Debris Project is to share solution oriented stories about how people in different places are acting to reduce plastic pollution. During my city excursions, I was delighted to see the filter water stations installed regularly through town. Understandably, plastic bottle consumption is growing fastest in areas where the tap water is not safe to drink. The network of water refill stations that has been established in Thailand is a viable solution to overcome the waste produced in what has become a conventional bottled water system. Culturally, the overconsumption of single use plastic de-values this important material, which has caused devaluation of material worth. The recycling centers that line the canal road south of town have established a good way of maintaining the value of raw material. It was inspiring to see so much material sorted through and actively streaming back into use. 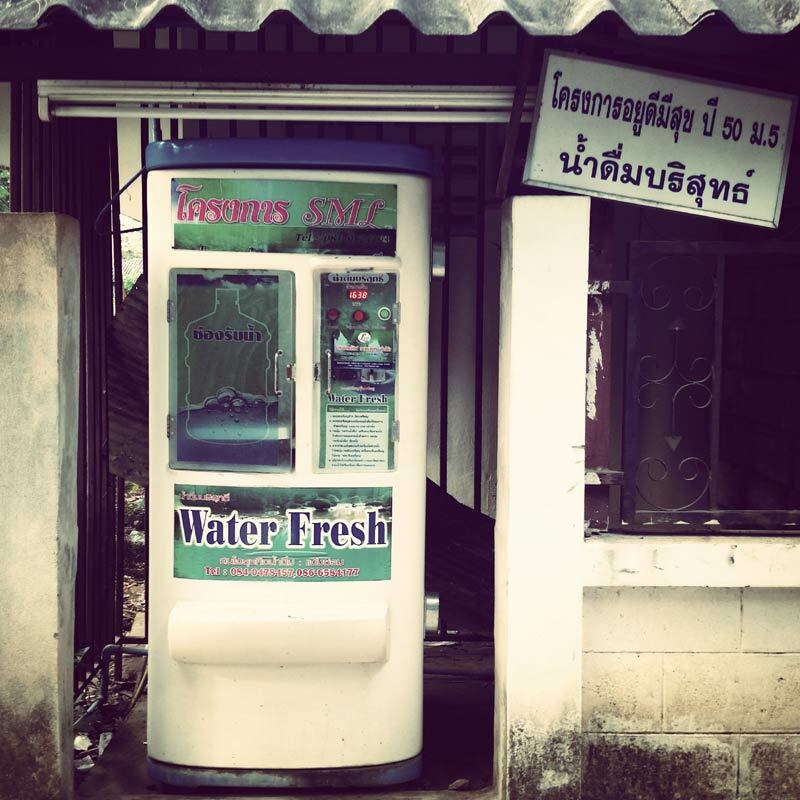 A filtered water re-fill station commonly found throughout Thailand offers inexpensive drinking water, which also cuts plastic bottle waste. The other impressive part of the community around Chiang Mai are the children. The next generation is very much in tune with the issue of plastic pollution because they care about a clean environment and about animals. The work they made for the Debris Project expresses their concern and is an important reminder that according to Dr. Edward Hume, the largest legacy we are leaving to the next generation is quite literally trash. I don’t like thinking of my son inheriting an impossible amount of garbage, and have found most parents would agree. We are getting sick from the chemicals from which plastic is made, as well as by chemicals absorbed by plastic when both enter marine environments. In addition to a myriad of degenerative illness, one of the biggest impacts of these endocrine disrupting chemicals is infertility. The impacts are trans-generational meaning that when I’m exposed to the toxins carried by plastic, it is my son and grandchildren who bear the health impacts. The issues around plastic pollution are far more than just aesthetic. 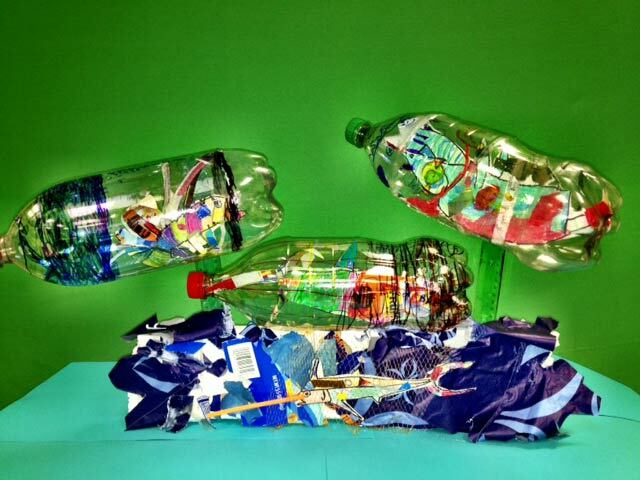 The Debris Project acts as a tool to educate communities about plastic pollution. So far, it has engaged participation from collaborators across the Pacific and Atlantic oceans, the Caribbean, Mediterranean and North seas as well as Himalayan and Rocky Mountain headwaters. The pieces of the installation are created through hands on workshops as part of educational programming integrated into schools and hosted by environmental organizations. We worked with children from across the region and found they were incredibly resourceful when it came to re-appropriating plastic as a material to come up with new uses for this material that would have been discarded. The children at the Schools of Hope, who are primarily Shan refugees from across the Myanmar border, don’t have access to a lot of toys. When they learned they were free to do anything with the materials, many of them made themselves new toys like cars out of plastic bottles. 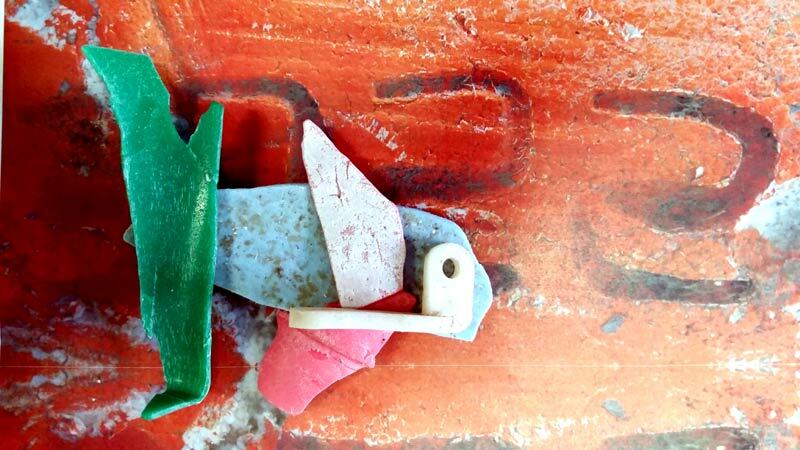 While the primary focus of the Debris Project is to create representations of marine life integrating plastic, inventive repurposing of material by any creative means is also encouraged. We are constantly exploring how we can continue to cultivate the concern and resourcefulness demonstrated by the children in these kinds of communities. A student from the Schools of Hope makes a new pair of dolls for herself. The Project is strengthened by collaborators who take the idea and run with it. The kids at the Stratton ABC Foundation decided to make a plastic bottle demon who will migrate around the city to raise awareness to plastic pollution. Art Relief will build a culmination of their workshops in the form of a giant plastic bottle, which carries on a ‘Message in a Bottle’ theme that has been manifested in different ways in various geographies. From a performance in the British Virgin Islands to an installation at the Denver Aquarium by marginalized immigrant youth to a project by high school students from the Bay Area in California, youth around the world are sending the message to reduce plastic waste. Both installations will include the plastic demon created by the Stratton ABC children, and integrate images that were created during area workshops interspersed with images gathered from around the world to reflect the universal nature of plastic pollution issues. 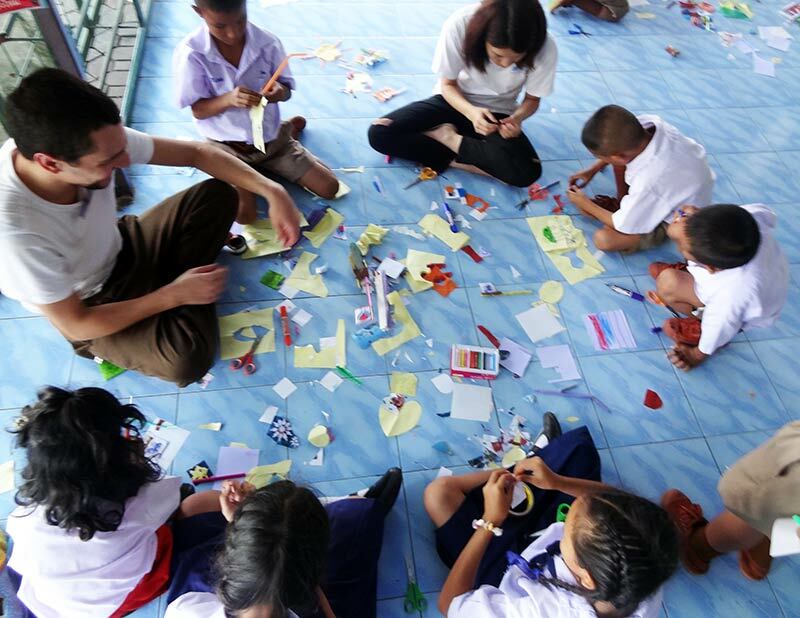 As integrated into the local programming and engaging installations, this collaboration presented solutions on how Chiang Mai may join the movement to leaving the next generation a world with a little less plastic. ‘Chevy’ The Plastic Daemon was made at human scale to migrate around Northern Thailand to raise awareness of plastic pollution from the back of a motorbike. Photo by Stratton ABC director, John Cope. Aragorn is a sculptor who has made a series of large iron vessels that he installed over the shallow waters in front of his workshop, which is laid out along the beach in Trellis Bay, just off Tortola in the British Virgin Islands. During full moon celebrations and for the New Year, he lights bonfires within his sculpted vessels. The Debris Project inspired him to come up with a performance piece which would ultimately act as a message in a bottle from the sea about plastic pollution during his New Years gathering. 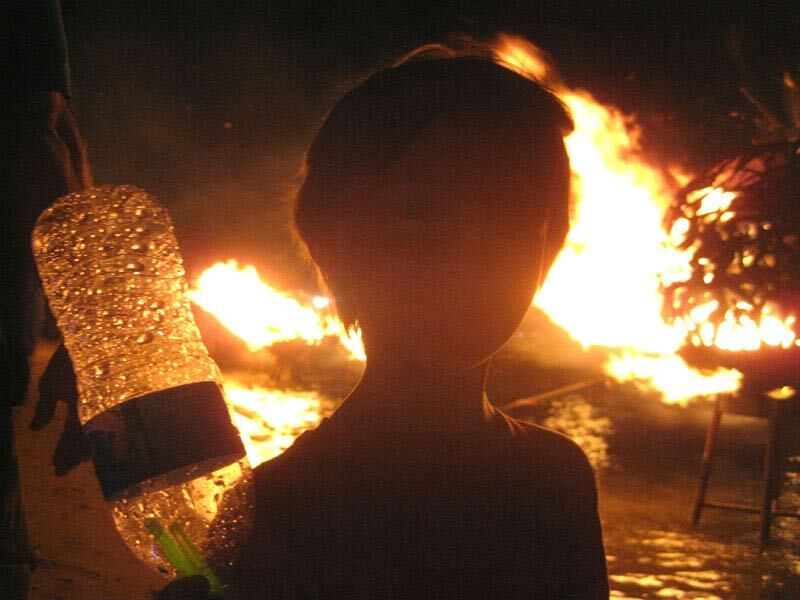 As the large crowd gathered on his beach looking across the twinkling bay in anticipation of the celebratory fires, hundreds of glowing plastic bottles washed ashore at their feet just before the sculptures burst into flames. As an unanticipated but welcome end to the action, local kids swarmed the beach to pick up every one of the bottles. Their beach clean concluded the event on a hopeful note as the next generation acted as stewards for the beach. Island music and revelry ensued. The project worked effectively because as sailors, we were able to deduce the direction of the wind so that we made sure the bottles hit their target, and did not add to ocean debris. Repurposing the bottles further, Aragorn used the bottles as padding to pack the ceramic works that are shipped out from his workshop. 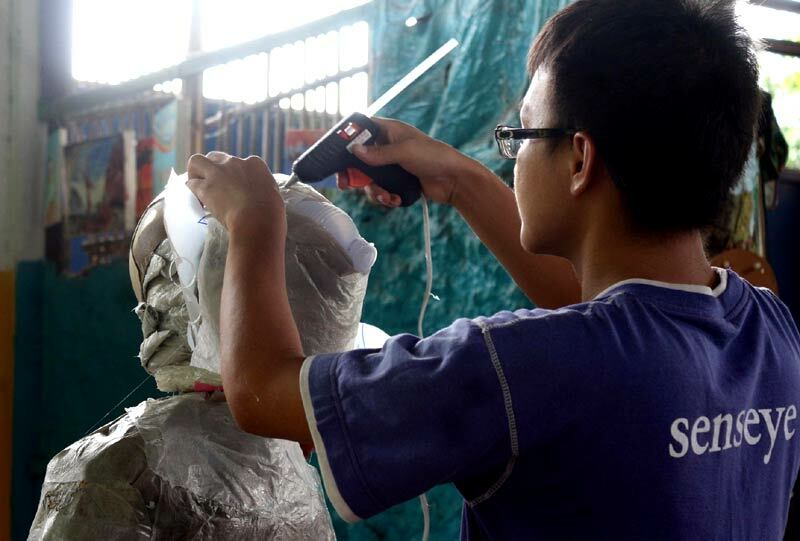 He makes this a regular practice; collecting used plastic bottles from his neighbors’ cafes and using them as packing material for his creative works. A few months later in Denver, the arts educator Kristen Heeres drew inspiration from this tale to develop a creative project inspired by the event. She worked with her 4th graders at Holm Elementary, a school which serves a largely immigrant population. 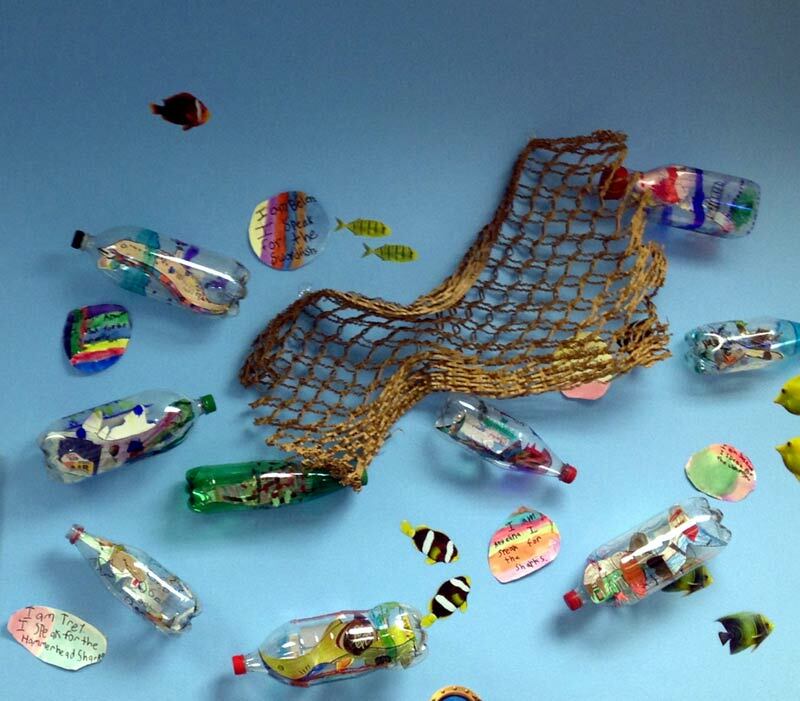 They made representations of marine life which they inserted into plastic bottles. She took the series and installed them at the Denver Aquarium, who then invited the students to view their installation and gave them a tour of the marine installations. This invitation allowed them access to the bus for a field trip, a rare opportunity for a cash strapped public school. Their tour exposed them the large tanks filled with the marine life they had studied as part of the project. Most of them did not have the capacity to afford a $27 entry fee, so it was their first direct exposure to marine life. They left in awe, inspired to integrate action into their daily choices around material use and waste reduction. The Debris Project works most effectively when it gives communities access to experiential learning demonstrated here. 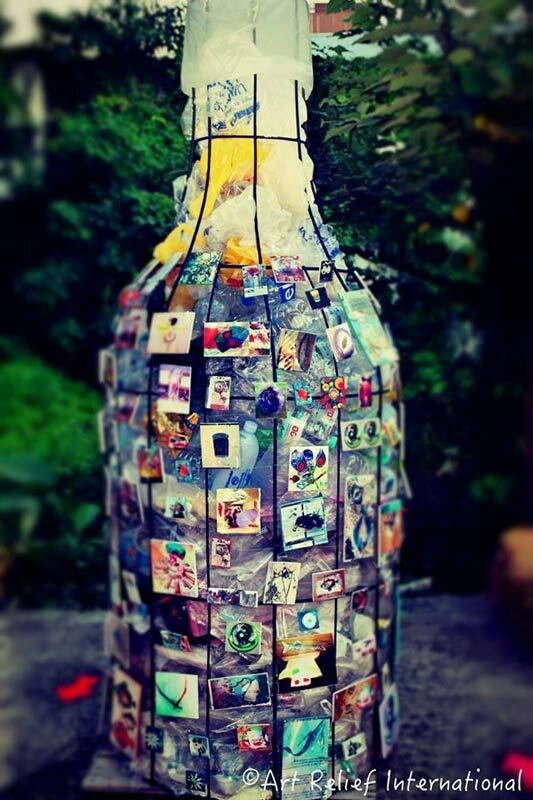 The stories of how plastic bottles were used to convey messages about plastic pollution then migrated across the Pacific to Chiang Mai, where Art Relief International presented a culmination of their Debris Project programming in the form of a large bottle. Having worked with schools across greater Chiang Mai, they used the Debris Project tiles as a skin for a large bottle, which they filled with plastic discarded from their offices. As a poignant reflection of their internal use of plastic, the sculpture allowed the organization to recognize how they were using the material. The bottle was installed at Thapae East in Central Chiang Mai. Arts director, Emma Gabriel says that she intends to continue to integrate the repurposing of discarded plastic as a primary material in their future programming. The 3rd grade atelier was inspired to make a coral reef using existing Debris tiles layered with marine debris & antique print reproductions. The philosophy of the Ricks Center follows an immersive approach to learning that is largely driven by interests expressed by the students themselves. This population is comprised of ‘justice-seekers’ who care deeply for the world at an early age. The passion and enthusiasm demonstrated by the students during their visual exploration of the issues surrounding plastic pollution is inspiring. Their depth of understanding of how the issues are interwoven through our daily lives instills confidence that it is not only possible to educate children on the impacts of their choices, they can also take the initiative to develop better habits. We are left with a feeling that this generation is quite capable of stepping up to the environmental challenges they will face through their lifetime, as long as we take the time to engage them in an in-depth consideration of the issues at hand. The Debris Project was integrated into the arts portion as an introduction to the Passions with a Purpose segment of the spring semester. The students were then encouraged to pursue the development of a project around their own passions for the remainder of the semester. This gave them an opportunity to experience what it was like to share their passion while trying to engage a wider population around the issue they had chosen. The 3rd and 4th graders at the Ricks Center have been working on a unit titled Passions with a Purpose where students use one of their passions to make a positive impact on the world. The Beyond the Art Room Debris installation was the perfect opportunity for students to use their creative pursuits to participate in creating an installation that brings awareness to a particular cause. The students were first introduced to the project when Lee Lee talked to the students about her own artwork and the work she does to bring awareness to the pollution of our oceans, and in particular the invasion of non-biodegradable plastics. Students then used found pieces of plastic that washed ashore to create individual pieces of ocean life that would be incorporated into a larger installation. 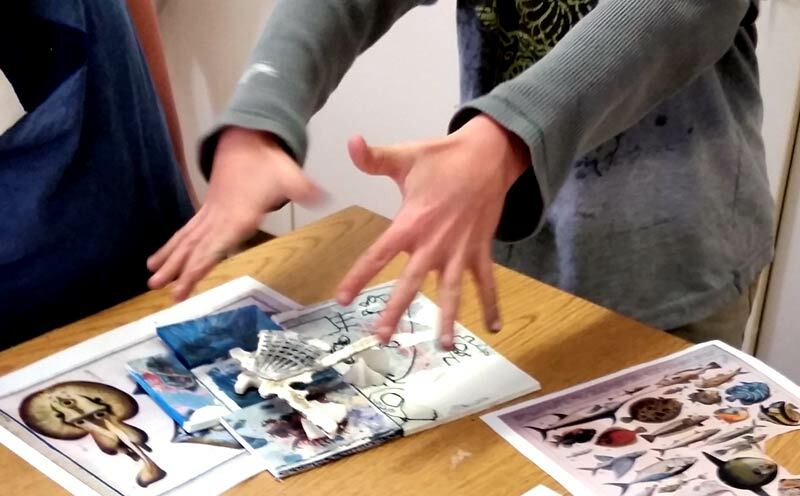 Students were allowed to build their own connections between ocean preservation and the materials that would form their artwork. As a result, the artwork the students created ranged collages of fish and turtles to assemblages of coral reefs with its own mini-ecosystem. 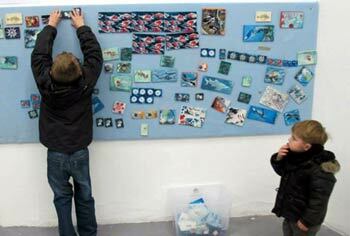 Reef ecology: the students worked together to collage found plastic, images from the existing installation and illustrations of reef fauna to build this representation of a coral reef. 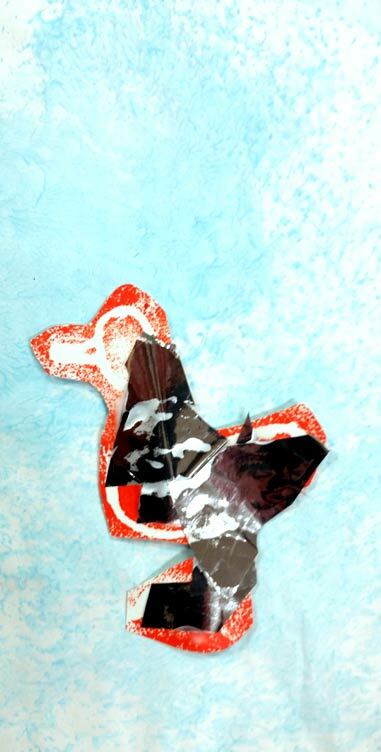 Duck created in the Pre-K Atelier using textures printed from plastic layered with re-purposed material from the Creative Recycling Center. As we approach Spring, Early Childhood students become very excited about animals and water subjects. It was a perfect opportunity to collaborate with the Debris Project. Because of our gifted population, there is a global awareness and sensitivity to the world around them, even at a young age. Art with a Purpose is always a favorite topic – so combining their love of water, animals and community purpose – is always successful. This is also a wonderful opportunity to collaborate with other ages and to begin understanding of how the individual works toward a common goal that involves multiple age groups. Also the idea of multiple individuals having the same vision but vastly unique outcomes is incredibly valuable at this age. Using our in-house Creative Recycling Center (CRC), Preschool students started with plastic lids and added foam pieces, aluminum foil, sequences, and other random recycling materials to create fish. I gave them a brief demo before we started and they had to work out the form and function of fish to be sure to include mouth, fins and eye. I’m always looking for opportunities to expose PreK students to printmaking. In PreK, we talked about local water animals (animals that live in or near water) as a whole class and their understanding of how human made debris in the water system affects the animals and their habitat. After choosing an animal, they created a simple line drawing that we transferred onto a foam plate. For the background we rolled cool colored paint on to plastic bags, plastic netting and bubble wrap and printed on paper. For the animals (foreground), we printed the foam plates using warm colors and then added plastic Creative Recycling Center materials to embellish the final animal before adding them to their background. Material Migration: this fish was pieced together at the Ricks Center using plastic gathered from Maui and photographed on an image of a buoy found in Maine to reflect the wide geographic range of plastic pollution. Even as Debris exists on a platform of technology and mechanical reproduction, the work maintains a handmade quality through the collaborative process. In order to keep the participation accessible at a distance, participants e-mail digital files to be included in the project. Makers may share their work without the expense of shipping physical pieces. It also allows makers to keep their original works intact. 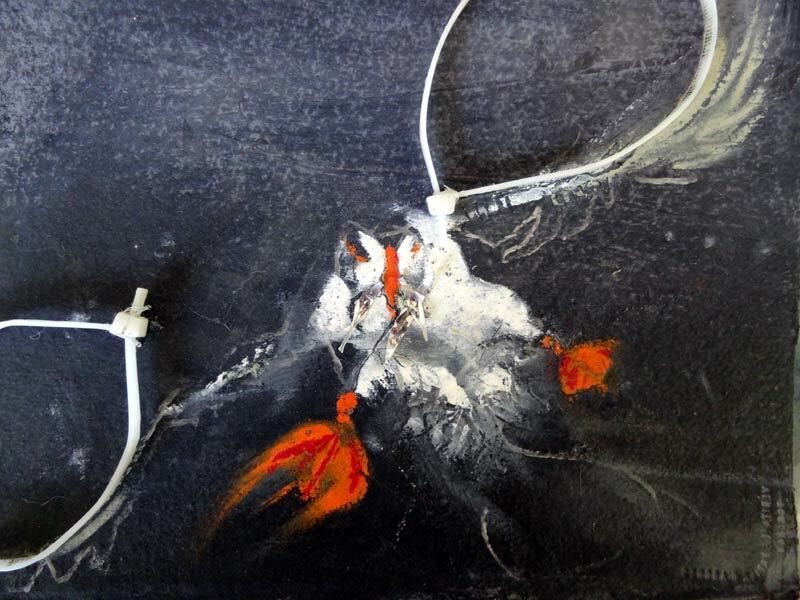 When ‘released into the ocean’ the images become open to transformation in the spirit of collaboration. The collaborative process echoes the processing of material in the ocean. The pieces are copied, distressed, reworked, torn and mended by participants. The transfer technique is purposefully imperfect. The creatures attain a rubbed out look, or have missing parts so that their appearance echoes of the corporeal impacts of plastic. Without relying on the sensational but disturbing images of entangled wildlife, this part of the process offers a representation of the disintegration of the species. As pieces are reworked then photographed, the images are unavoidably degraded and the creatures obtain a blurred appearance. This blurring effect reflects the undulating quality within marine environments and bring an element of depth when interspersed with sharper images. In actual marine environments, growth stems out of decay. 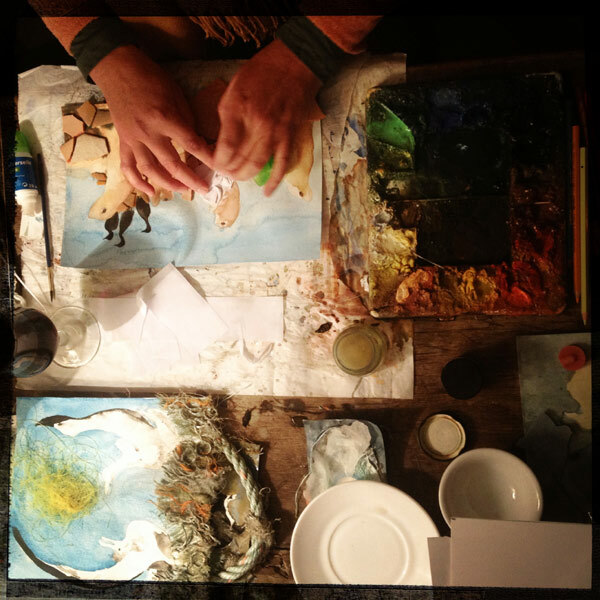 Balancing the destructive process inherent in the transfer process, are acts of creation and mending. This part of the process is about preservation; it is a symbolic representation which help us arrive at an awareness that we may bring to the everyday decisions around our consumption of over-packaged products. There is often a misconception about ocean ‘garbage patches’ being enormous floating islands made up of trash. No matter what material they are made of, large floating objects are essential components in open ocean ecosystems. The reality of the plastic in the ocean is far worse; they consist of vast swaths of confetti sized plastic debris which is impossible to recover. The structure of the Debris installation is made up of small pieces to reflect the nature of the way plastic breaks down in the ocean gyres. Plastic is a material that photo-degrades, it breaks down into smaller and smaller bits, but it never cycles back into the environment. It eaten by fish and sea birds, which is fatal because the animals feel full but are not nourished and end up starving to death. Worse yet, it is an entry point for endocrine disrupting chemicals to be absorbed into the marine food web. Taking a reductive approach, Debris does not impose any kind of educational ‘model’ onto situations of engagement. Instead, it is designed to be a flexible tool which may be used to fit the needs of an institution, and remains open to cultural and creative interpretations. As long as the work follows the overall concept which addresses the impacts of plastic, collaborators are free to use it in a way that benefits their programs or practice. Reenie Charriere leading a workshop at the Chateau de la Napoule in France. 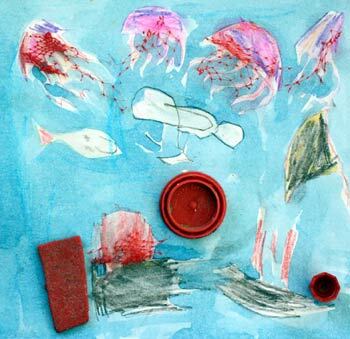 The children were creating works out of repurposed plastic found along the shore in the Cote d’Azur region of the Mediterranean Sea. Largely geared towards youth, the Debris collaboration is a hands on way for young people to learn about the impact of plastic while contributing to solution building. Participants arrive at solutions by learning about alternatives to the convenience oriented culture that produces excessive amounts of waste through becoming aware of the impact on ecologies, cultures and our health. Only in the last couple of generations have we shifted towards a ‘throw away’ culture, so it is possible to reframe cultural attitudes towards valuing materials made from a limited resource within a similar timespan. In order to address misplaced cultural notions of disposability, it is necessary to encourage a reconsideration toward waste at an early age. Children are essential partners in environmental activism as they carry the issues to the hearts of their families. Beyond their roles as messengers, the quality of their marks adds a dynamic quality to the overall installation. Debris is an educational tool which may be used in a way that may complement a specific institutional focus. For example, the University of Colorado in Boulder has a departmental focus on the study of diatoms. Diatoms are single celled organisms that make up the vast fields of plankton which serve as the foundation of the marine food web. Ocean plankton provides half of the earth’s oxygen and captures half of our carbon, so it is essential for supporting life on this planet. We can’t clean up plastic without also removing the plankton. During a family activity day hosted by the Museum of Natural History at the University, participants created a host of diatoms to release into the Debris installation. It is an important contribution because plastic immersed in fields of diatoms are a trigger point for some of the worst impacts of plastic pollution. Emerging research by institutions like the Marine Environmental Research Institute (MERI) in Blue Hill, Maine, are looking at the ecological impacts of microplastics; plastic debris that are small enough to blend in with plankton so that they become easy to consume by small marine organisms. 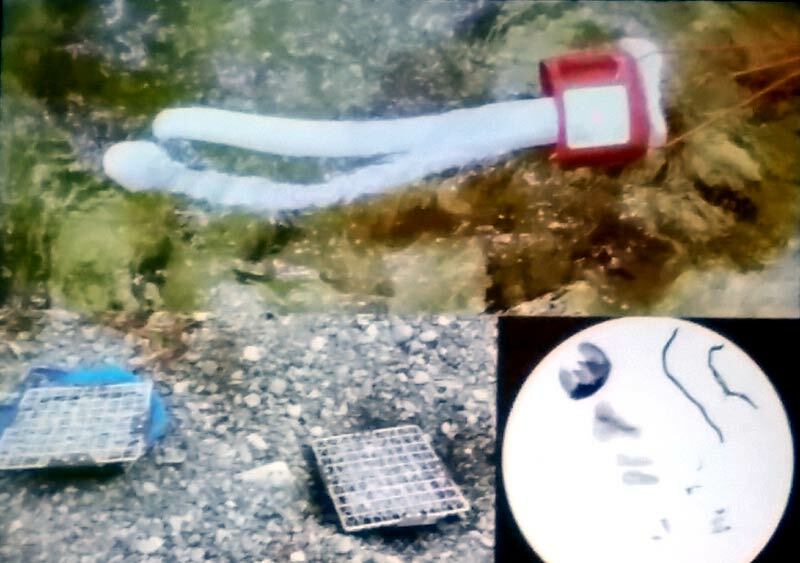 These pieces are photo-degraded from of larger pieces of plastic, or are released as plastic microbeads, which are commonly used in cosmetics like facial cleansers, and shed from material like polar fleece when it is laundered. Chelsea Rochman is a marine biologist who is currently looking at the high concentrations of chemicals which absorb easily into the material of plastic, and how they desorb into the flesh of the marine life who eats it. The chemicals are fat loving. Plastic is made from oil, which is essentially a fat, and can absorb chemicals that are millions of times more concentrated than ambient levels within the surrounding waters. When consumed by marine life, these chemicals desorb into the flesh of the marine life, is stored in their fat, becoming more concentrated every time they are consumed. As the chemicals desorb into the flesh of marine life, the animals experience hormonal changes that disrupt the capacity for life to breed by causing infertility. Chemicals are invisible, but in the Debris installation plastic serves as a symbolic representation of the chemicals that are harbored within by integrating the material into the corporeal structure of marine creatures. Not only is the project open to a range of institutional appropriations, it embraces diverse expressions from creatives as well. Aragorn has a beach front workshop on Trellis Bay near Tortola in the British Virgin Islands. During his last New Year gathering, he was inspired by Debris to execute an art action that presented a message from the ocean about plastic pollution. 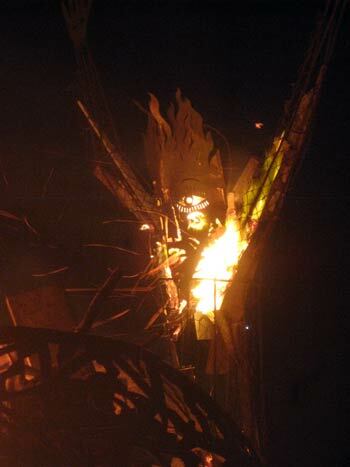 After enjoying Caribbean music and feasting, a large crowd gathered on his beach in anticipation of fires being lit within Aragorn’s large scaled iron sculptures which are installed in the shallow waters just off his beach. As the crowd waited, peering across the dark waters, hundreds of glowing plastic bottles washed ashore at their feet. The sculptures then burst into flame. A group of island children ran across the beach collecting the bottles in an unexpected and satisfying end to the creative action. 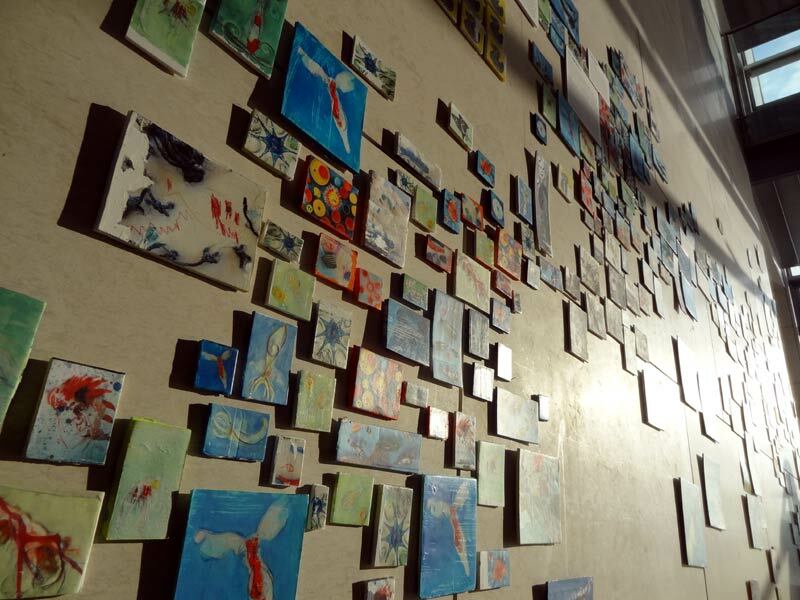 Kristin Heres is an arts educator who built a variation of Debris with the students at Holm Elementary in Denver, CO. Inspired by Message in a Bottle performed by Aragorn in the British Virgin Islands, she came up with a way to use the project as a means to provide the opportunity for these students to connect with marine ecology at the Denver Aquarium. 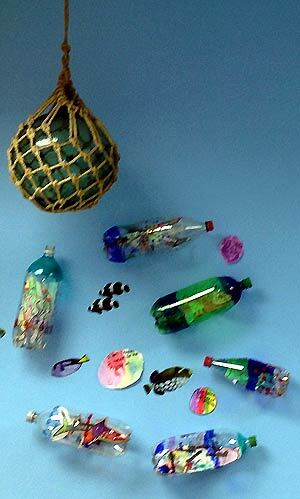 The class made representations of marine life and placed them in plastic PET bottles for display at the aquarium. Holm Elementary is an underfunded public school which serves a population who lives on the fringes of the city. Families there don’t have the luxury to spend money on tickets to the aquarium. However, because their work was installed at the aquarium, the class got permission to take a field trip to see it. The aquarium staff gave them a tour, which was the first direct experience with live marine animals for many of these students. The experience left them in awe. In order to cultivate a concern for the environment, it is important that people feel a connection to the natural world. When this project helps inspire youth to feel this kind of connection, then it is considered a success. The collaboration is a gathering of concerned voices from all over the world, around issues to which we are universally exposed. One reason there is no ‘model’ that accompanies this piece is so that the work may maintain an authenticity to the contributing voices. It remains open and inclusive of a wide range of cultural interpretation. For example, there is no other place than Haiti that could offer an authentic representation of the Vodoun Lwa, Boussou, the god protector of the seas. The strength of this project lay in gathering a wide range of cultural ‘voices’ around a single material that has become pervasive in the waters that connect us. Over the next year, the open ended project will travel to the land of a thousand lakes in Minnesota, on to Maui, Thailand and back around to Ireland in order to continue widening the geographies that make up this project. Makers keep originals, and collaborators keep alterations they have made. Small groupings of the installation are left with collaborative organizations so that the the physical work is as dispersed as the contributions that have been made to the work. As a conceptual element to the work, this dispersal is a reflection of the widespread dispersal of the actual debris. In addition to the physical installation and workshops that engage communities on the ground, the website, www.virtualvoices.org serves as a central nexus to the Debris project. Specific engagements are detailed in a way that offers inspiration to address the issue in creative ways. 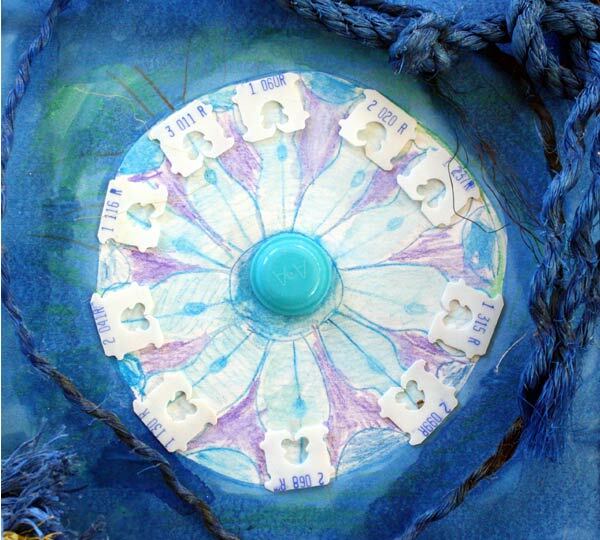 Effective programs developed by creatives that address plastic pollution are shared. For example, Bhutan is a place that is new to plastic pollution as they have only started opening their boundaries to the outside world. 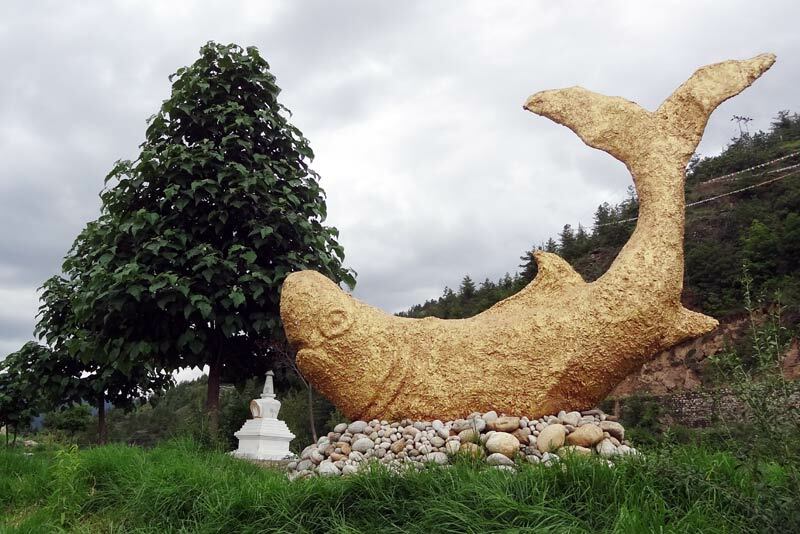 The Voluntary Artists Studio of Thimphu (VAST) has developed ways of talking trash with their community in ways that challenge people to see how their relationship with waste is transforming. They engage the scope of their community ranging from workshops with kids, public installations to engage professionals, and have implemented a recycling program that inserts a small economy for elders. Their myriad of waste oriented projects are described online in order to offer ideas on ways that creative activists are engaging community participation around these issues. By inserting Debris into situations that lay outside the realm of plastic activism, ocean studies or even art, the work is able to engage a wider range of populations who are still directly connected to the issues at hand. A string of pop up workshops at the Terra Madre conference in Turin, Italy, connected plastic pollution to industrial agricultural practices. Stepping beyond traditional boundaries of disciplinary practice broadens the dialogue in both the arena of food justice issues as well as plastic pollution, strengthening activist voices that stem from each movement. Endocrine disrupting chemicals used in industrial agriculture release persistent organic pollutants into marine ecologies. Ultimately they drain to the oceans, where DDT and PCBs used a generation ago still persist. There is no way to reclaim these chemicals. Including Debris on an agriculture platform connects issues around plastic to a convenience oriented culture that is steeped in the overuse of chemicals. Slow Food International was founded to counter the effects of a fast food culture through all levels of cultivation and consumption. The organization tackles food justice issues in a celebratory manner around maintaining traditional practices of sharing nourishment. The movement offers solutions that encourage us to step out of the racing pace of contemporary mobilities to slow down and gain appreciation for the way we produce and consume food. Through a return to traditional food practices, we may reduce the amount of packaging we consume thus decreasing the physical waste of plastic. More importantly, through decisions we make at market, we may reduce our chemical footprint by maintaining an awareness of how our food has been grown. Specific to the geography of Copenhagen, the cold waters of the far north and south bear a particular chemical burden. Endocrine disrupting chemicals easily attach to fat, so when persistent organic pollutants enter into the marine food web, the chemicals migrate through animal ingestion, becoming more concentrated in animals who carry a lot of fat. Bioaccumulation in wildlife in the Artic circles means that the animals in cold climates bear the brunt of the chemical exposure even as they live far from industrial practices. Consideration of how we are connected to chemical use in mining and agricultural production is vital to addressing these issues; even as we live far away, the nature of the chemicals is such that they can migrate vast distances on an air or wind current, or in the fat of a migrating animal. In this way, chemicals released anywhere in the world may arrive on our doorsteps. Part of solution building includes an awareness of where our products come from. Beyond the carbon footprint of transport, consideration of the production is essential to reduce our ecological impact on the world. It was the children who started noticing the influx of trash around Thimphu, the capital of Bhutan. You can not go but a few minutes sitting on the banks of the Raidak river without seeing a PET bottle bobbing down its watery course towards India. They were inspired to address the profusion of trash that has only recently become prevalent in this society that prides itself on their pristine environment. The Voluntary Artists Studio of Thimphu (VAST) runs an array of community engaged arts programs. They welcomed ideas from the youth in their community and came up with a string of programs that has brought the issue to light in their community. The organizers at VAST recognize the value of working with children, especially around these kinds of issues because it empowers the young participants, encouraging them to carry messages into the broader community through sharing their ideas with their families and classrooms. When we reinforce the importance of these topics which the children have demonstrated are inherent feelings, then children are encouraged to actively engage their circles to change attitudes towards an issue like waste. Bhutanese are used to organic material being the primary packaging of their consumables. The population maintains strong habits of tossing aside packaging, knowing that it will be reabsorbed by the earth. But these habits become destructive once the packaging is replaced by synthetic materials like plastic. It is a time of transition in Bhutan. The cities are growing rapidly and house nearly a third of the population of the country. As with many burgeoning cities, it can be a challenge to implement effective infrastructure systems, like waste management, which rely on public participation. Artists play an key role of reflecting the ways and beings of their communities, constantly examining the evolution of societies. The artists at VAST are no exception. In regards to plastic pollution, they have come up with provocative public installations and projects which lend themselves to offering solutions to this emerging problem. Their workshop is housed in a building across the road from a former dump site along the Raidak river. The VAST community set out to restore this dump site to an ecologically stable park. The site had been full of invasive Russian poplar trees that the government helped them cut down. Using the remnants, workshop participants pieced together the first sculpture for the park, an orb made of re purposed poplar wood. The work echoes the structure of a birds nest, and is an lovely form to start the sculpture park that has been growing on the cleared land. They have amended the soil and planted trees to protect against erosion as the river runs strong during the rainy season. There is a spring which serves as the heart center of the park, around which they are developing a medicinal zone so that community members may find healing that is growing forth from this healed land. The members of VAST collect the debris that has become commonplace, and re-purpose it into the sculptures that are installed in the evolving sculpture park. 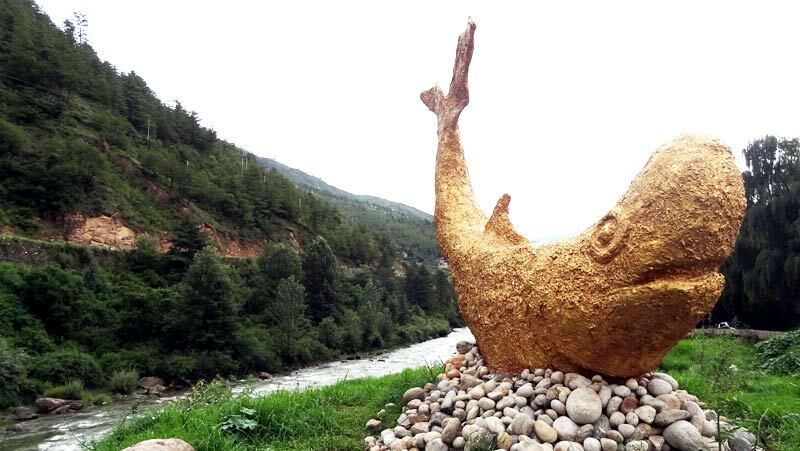 The golden fish is built from recycled waste and it is built with a very regional aesthetic. The golden color makes it a popular landmark in a culture that values the sheen used frequently in sacred spaces. The colorful plastic bottle tops were an appealing material for the participants of the workshops, and they have been using them to make decorative skins on tree stumps among other sculptures. The organizers at VAST felt that it was not very productive in addressing the overall ecological concerns of the environmental impacts of plastic bottles, so they encouraged community members to bring in the PET bottles with their caps. The bottles were offered to elders in the neighborhood as a resource that they could sell to Indian recycling centers for a small profit. This program not only helped clean the area of PET bottles, it provided a micro economy to an otherwise marginalized community. Bringing the issue into the heart of their city, the VAST community set up a provocative installation around the clock tower in the central plaza of Thimphu. Here, they installed piles of garbage that climbed bamboo lattice work that was mounted to the clock tower. 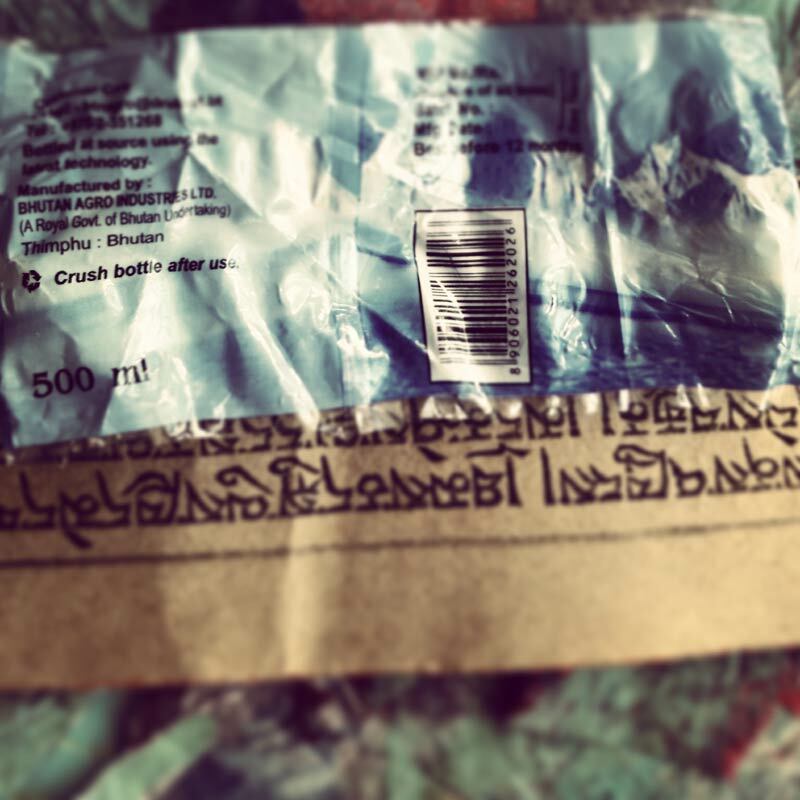 Interspersed with the trash were informational signs that described the problems wrought by the presence of plastic waste, calling on the community to recognize the importance of ecological awareness in these days of transition. People were initially angry that these students had filled the plaza with trash. But the students stationed themselves around the installation to engage the public in conversation about the issue. They invited people to walk the paths that were structured through the installation as a sort of discovery journey. The paths led participants around the plaza as if they were walking medicinal wheels of self realization. Ultimately those who took the journey came away with an understanding of this issue that can be hard to digest, but which has an impact on everyone within that sphere. Unfortunately there is no lack of plastic in Bhutan. It is a growing problem in this kingdom perched high in the Himalayas. There appears to be a thriving natural ecology. However, where there is an influx of human populations that are embracing the materials of our age, then there is bound to be plastic embedded in the trees. That so many artists have been invited to participate in this discourse about how to inspire planetary stewardship in the Anthropocene is an important part of engaging communities around the issues at hand. Many of the environmental issues within the Anthropocene can to be addressed by different disciplines including the sciences and the arts. Science provides us with the knowledge that informs us to help make decisions and opinions. If Science studies the natural world then art can show components of this world in a way that is accessible to the general public through various media. Science provides us with evidence through raw data and examination of results and art appropriates the evidence so that we may make moral judgments about environmental issues. I’ve been building an internationally scaled artistic collaboration, deeply rooted in science, which addresses a definitive material of our age; plastic. Debris is an interactive installation which is being created as a response to particular problems presented by single use plastic. 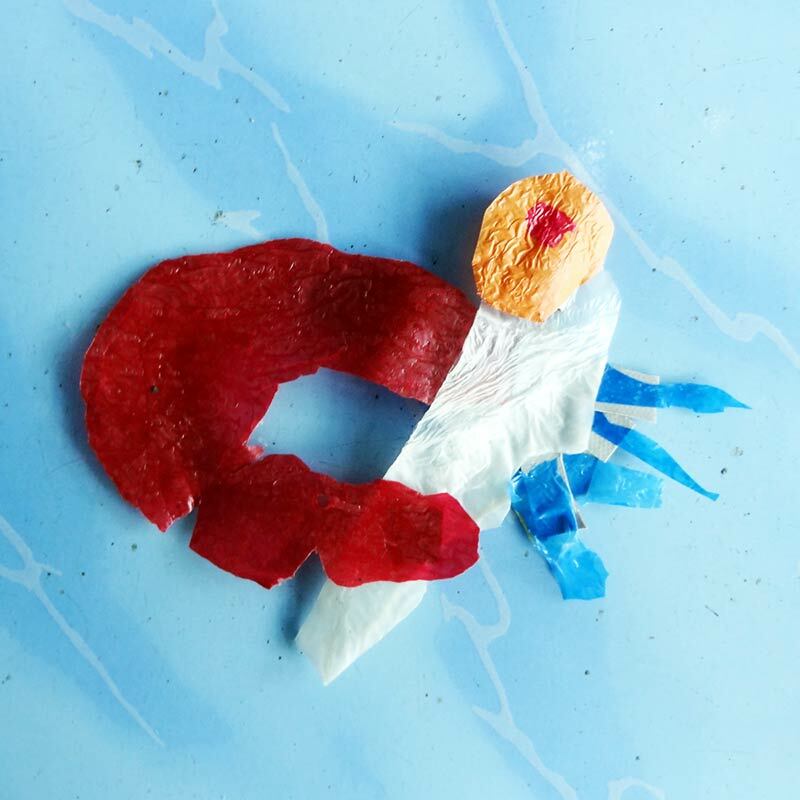 The work reflects the literal problem of plastic in marine environments, while offering a symbolic representation of the chemical body burdens it imposes on wildlife and humans alike. In presenting these issues, we are asked to consider misplaced notions of “disposability”. This has called in to question consumer driven waste which has devalued what is in fact a very important material. Through creative means, participants are offered a hands-on, educational tool that shows us how we are enmeshed in ecological and health issues surrounding plastic. The Earth is one giant ecosystem, where living and nonliving parts in the environment interact with each other. Debris has provided a creative platform that express one’s concerns about plastic waste and explores alternatives to reduce the impact of plastic on the environment. This creativity has the capacity to help preserve specific biomes and encourages ecological stewardship. 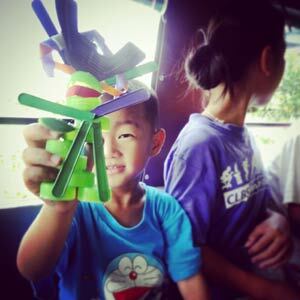 The youngest member of the Stratton ABC Foundation in Thailand holds up his new toy Samurai that he made from re-purposed plastic that would have been otherwise sent to the land fill. We are all citizens of the Anthropocene. Addressing environmental problems strengthens planetary stewardship. If we are to be good stewards, global action must include working with poverty stricken areas. In these areas, securing the next meal for a family or keeping a roof over their head is a constant struggle for survival. Even with these daily challenges, poverty stricken communities are able to recognize the importance of the environment and strive to maintain balance, despite limited means. I would like to talk about one of the most economically marginalized areas in the western hemisphere, the ghettos in Port-au-Prince, Haiti. Educational ‘models’ rarely work here. Haitians have long been subjected to the impositions of outsider worldviews while suffering severe injustices due to globalization. Haitians are not naïve to their history and current situation. Scholars have examined how, even with the best intentions, the imposition of external ‘models’ can be insensitive and dominating in a way that extends forms of neocolonialism and damages the social fabric of the community. Of course there is good work accomplished by international organizations, and it’s important for us to examine what makes this work successful. The most effective work grows from collaborations within the local community. In regards to plastic pollution, we don’t need to tell Haitians in the ghetto about trash. These are people who have quite literally been thrown out with the trash. Their government doesn’t recognize profit in trash collection so they only do it once a month. Trash piles up on corners, clogs drains and fills the twisted footpath scaled alleyways that weave through these densely packed neighborhoods. Haitians have a very clear understanding of how much waste they produce because it stays present in their lives. I feel that a more humble and respectful approach is necessary when working collaboratively with the Haitians. They have a lot to teach us and we can learn a lot from them. Here in the United States, most municipalities remove their garbage to a remote waste site, thus putting garbage ‘out of sight’ and ‘out of mind’. In his book, Garbology, Edward Hume describes how in the United States, our biggest legacy to our children is trash, but Americans have little sense of the amount of garbage we produce because it is hidden from us. Despite the overwhelming presence of trash in the streets of Port-au-Prince, the reality is that we as Americans consume more and unwittingly produce a lot more waste. Last winter I worked with the Atis Rezistans. This is a group of artists who take trash and turn it into exquisite sculptures. Repurposing material is a main principle of the Debris installation, so I was excited to see how deft the Atis Rezistans are at their art. Instead of imposing my idea of how this project would be shaped, I felt that it was more important to remain open to gathering and hearing the distinctive voices that grow out of a particular place. This allows me to build a genuine response from a diverse range of people that share a concern about this environmental issue which touches us all. Part of the Atis Rezistans community, Louis Kervens is a proud twelve year old with straight shoulders, a gleaming perfect smile and a heart he holds out in front of him. From him, I acquired a representation of the Vodou Lwa, Boussou, a spirit protector of the seas. When he offered me his collage made of cut tire, my response was not to tell him that there is no scientific evidence to support this spirit form (even though the overall project is deeply rooted in science). Instead I embraced his expression of his traditional culture and said “more than anything the seas NEED a protector, thank you for providing one.” In the overall installation, Louis’s piece speaks of no other place than Haiti. I envision a collection of works that express place as genuinely as this one does. 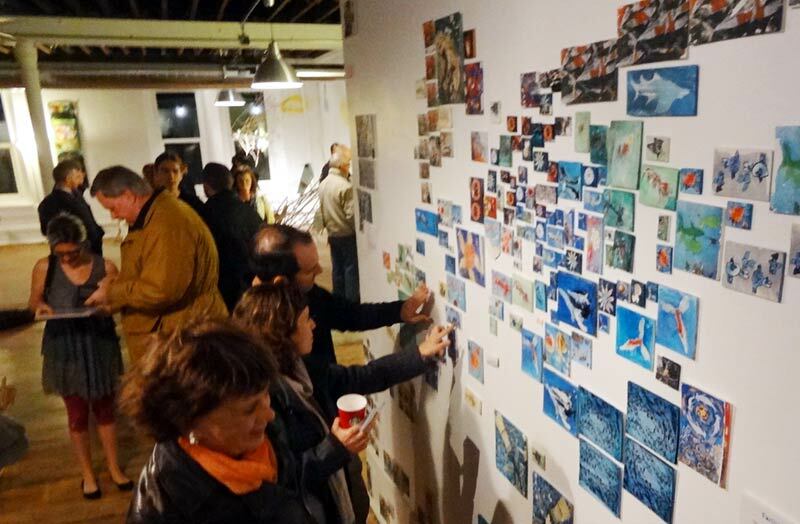 In gathering expressions specific to place from all over the world, the installation will ultimately become a large scaled call for awareness and action that stems from localized interpretations of the waste present in the waters that connect us. When we think of place, plastic pollution is certainly not limited to the ocean. I live in the Rocky Mountain West, where I’ve learned about inland connections to ocean ecology as well as the impacts of plastic on inland marine environments. Recently I presented a version of Debris for Amigos Bravos, an organization that works to reclaim rivers and ensure water safety in northern New Mexico. Their Beautiful Midden project was founded during the 2012 International Symposium of Electronic Arts (ISEA) in order to bring attention to a section of the Rio Grande gorge which had been used as an illegal dumping ground for over 20 years. Working in area schools, students are engaged creatively to make art inspired by the site. An important educational component to this kind of work is contextualizing our own actions; encouraging participants to recognize how we fit into global contexts of waste. In the west, toxins enter our waterways from industries like mining and agriculture. Home to Los Alamos, New Mexico struggles against leaking radioactive waste, and radioactive waste cans enter the visual language used in Beautiful Midden. Toxins end up traveling downstream and ultimately drain into the oceans. Dr. Theo Colborn was one of the first to recognize the trans-generational effects of endocrine disrupting chemicals in the Great Lakes region. She started the Endocrine Disruption Exchange, which is based in Paonia, Colorado. In her book, Our Stolen Future, she describes how easily chemicals can travel immense distances by getting swept up in water or air currents, or even migrating through food webs. Plastic is a material that absorbs high concentrations of Persistent Organic Pollutants (POPs) that have drained from inland chemical use. DDT and PCBs were used a few generations ago but still persist in the ocean. The research of Chelsea Rochman, a marine biologist, has shown that when sea life eat the small bits of plastic which have absorbed high concentrations of POPs, the chemicals de-sorb into their flesh and enter the food web. The chemicals become more concentrated every time the affected fish are consumed. Of course, plastic does not cycle back into the environment, it instead photo-degrades and breaks down into smaller and smaller bits. The fields of plankton that form the foundation of ocean ecosystems are saturated with microscopic bits of plastic that are easily consumed by the zooplankton and small creatures that feed there. A large part of Debris is made up of images of diatoms and plankton life forms. Last fall, the University’s Museum of Natural History presented a hands on version of Debris. This served as the endpoint of an educational journey, From the Mountains to the Prairies to the Oceans. The artistic images that resulted from the event were primarily diatoms because there is team at the University that maintains a focus of study on diatoms. Instead of building a ‘model’ for the Debris project, I aspire to leave it open and flexible so that it may compliment a particular program or institution. The voices gathered from each particular program then come together to contribute to a thorough investigation of plastic pollution from the unique perspectives of each area of expertise. We must not limit this flexibility to scientific institutions; I feel that it’s important to be open to artistic interpretations as well. I embrace various ways of engaging the public and relish in the opportunity to collaborate with artists who have a different vision on how to execute a creative work. Aragorn’s workshop is situated on the beach in Trellis Bay, just off Tortola in the British Virgin Islands. He hosts events that feature local music, Creole feasts and bonfires that burn within his sculptures that are installed above the shallow waters just off his beach. During his New Year’s celebration, he was inspired by Debris to orchestrate a Message in a Bottle from the sea about plastic pollution. A large group of people were gathered on the beach, waiting with anticipation as the steel sculptures were about to be lit. As they watched the dark harbor, hundreds of glowing plastic bottles washed ashore at their feet. Then the steel sculptures burst into flames. Heightening the overall effect of the message, a band of local kids ran out onto the beach and gathered all of the glowing bottles so that the beach was immediately cleaned. This was an unexpected but uplifting conclusion to the action. There are many sources of plastic pollution and chemical body burdens. By collaborating with organizations who address these sources (even if plastic doesn’t enter directly into their vocabulary), we demonstrate the interconnectivity of environmental issues. For example, industrial agriculture is one of the primary contributors of Persistent Organic Pollutants that cause endocrine disruption. One of the most important platforms for the global sustainable food movement is the biannual Terra Madre conference in Turin, Italy for which I’m honored to be included in the Slow Food US delegation later this fall. It was at the last conference that I met Jerry Brown, a Pacific fisherman. I had told him about creating the foundation of Debris during a residency at the Chateau de la Napoule in France at that time. His response was, “Finally, FINALLY, someone has brought up the impacts of agriculture on the Oceans.” His clear blue eyes held me in the steady gaze that only a true mariner can possess as we explored ways to bring this issue into the discourse that surrounds food issues. I’ll take Debris with me this year to demonstrate how the oceans literally connect us so that agricultural practices anywhere in the world contribute to, or help reduce, the chemical body burdens to which we are universally subjected. The main cause of plastic pollution is an inordinate amount of physical waste; the primary source stemming from a convenience-oriented consumer culture. Shifting attitudes away from consuming over-packaged goods and succumbing to the convenience of a throw-away society towards a recognition that there is no ‘away’ to throw things is paramount to solving our problem of plastic pollution. Later this summer I’ll take Debris to Mexico to engage participants in the Moving Beyond Capitalism conference hosted by the Center for Global Justice. My hope is to engage participants in a dialogue that relates to the issues at hand, while offering a tool for diverse geographic populations to explore ways to bring balance to the Anthropocene. By maintaining open, flexible creative responses, the arts provide a tool that weaves together the concepts of cause and effect as related to the single material of plastic. This project is a gathering of voices; it is not ‘mine’ but ‘ours’. My role is to maintain a central nexus around which we build an internationally scaled series of educational events and calls to action. I’d like to see people take inspiration and run with it. Online I offer descriptions of other creative projects, so that people can develop their own ideas. Kristen Heeres is an arts educator in Denver, who builds creative programming to complement elementary classroom curricula. 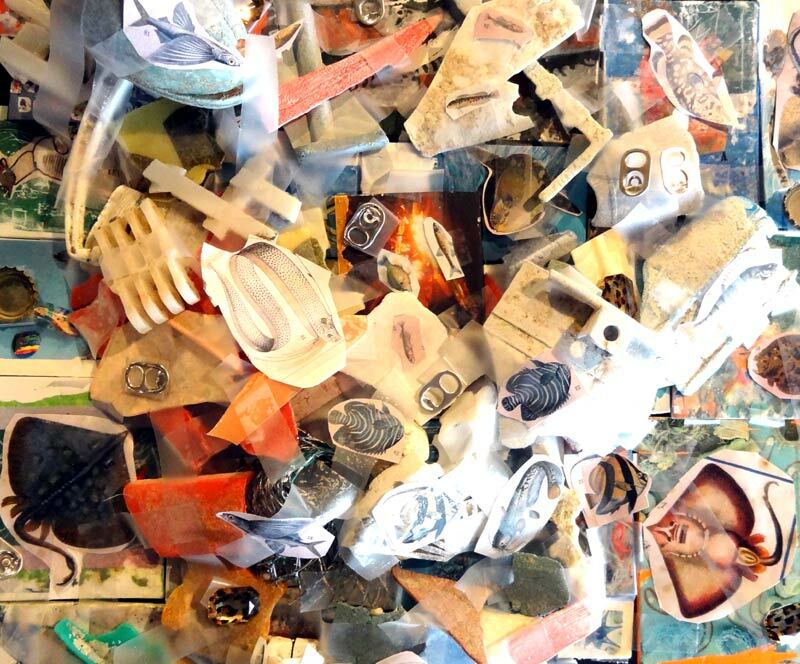 She spent time in my studio exploring Debris, then appropriated it into a fully developed project using the methods she saw in my studio as well as my recounting of Message in a Bottle from the Virgin Islands. What impressed me most about her approach is how she used the project as a means to get her students to connect to animals. She works with a bilingual class in a low income public school. They don’t have a lot of resources, and it can be hard to get funding for field trips. Her students first created fish with collaged waste then put them in plastic bottles, which she installed in the Denver Aquarium’s education department. It then proved to be an easy request for a bus to take them to see their work in the aquarium on a field trip, and Kristen took full advantage. Part of the DEBRIS installation at the Denver Aquarium by Kristen Heeres was inspired by the ‘Message in a Bottle’ performance by Aragorn and features representations of fish placed inside plastic bottles. As part of the trip, they got to tour the aquarium and see firsthand the marine organisms they had only previously seen in books. She felt the most satisfying part of the overall project was watching the kids’ faces fill with delight and wonder at these creatures. This direct interaction had a marked impact on the students. Marine biodiversity was no longer an abstract presentation in a book. This kind of connection and experiential learning is vital if we want to get people to care. Kristen is a dear friend and provides an important aspect to this collaboration. People may contact her for ideas on how to develop creative projects specific to their educational programing. Her information is available on our website. Through my own transformation into motherhood, I realized how moms can be a strong catalyst for change because we have an inherent need to take care of our families. Part of the reason I emphasize the health impacts of the chemical body burdens we carry is because people are inspired to address things that directly affect them. At this conference, we all know that plastic in the ocean is devastating, but frankly for most people, it’s a far off place that they don’t regularly think much about. By seeing the parallel of the environmental toll in the toll on our health, we can cultivate an understanding that leads to action as manifested through the day to day decisions we make. As moms, we try our best to take care of our families. As much as we are able, we make decisions that maintain a balance of health and happiness. When my son was born, I spent a lot of time interviewing pediatricians about the biggest health challenges for children today; Autism, ADHD, diabetes, infertility, obesity, and even Cancer. According to the Endocrine Disruption Exchange, all of these may be related to the chemical body burdens we carry. The way we take care of our families has cause and effect on our surrounding environment. The way we internalize these issues has direct external implications, for worse or better. The other essential partners in environmental activism are children. The arts are an ideal way to engage kids. Every time I put my son in any kind of program, he reports back with a very thorough critique. What I’ve learned from him is that he, as most young children, is most engaged through hands on projects. Listening to a talking head leads to glazed over deafness. Letting children feel that they are part of a solution is empowering for them. Giving them the opportunity to voice their concerns for their own futures is essential. They LOVE the international element of this particular project, and I will often pull out a map to point out all the different places that voices have contributed to this act. More important than anything else, children bring the issues to the hearts of their families. I want to leave you with a story I heard while having tea with a naturalist in one of the most biologically diverse places on earth, the Osa wilderness in Costa Rica. He told me about a program initiated by the government in Costa Rica in response to the crocodiles teetering on the edge of existence. Water in Costa Rica, like everywhere, draws wildlife as well as the development of farms. Livestock by their nature, are easy prey for crocodiles as they drank from the river during the dry seasons. Naturally, farmers would kill the crocs to protect their animals. But crocodiles are an important part of the ecosystem, like all predators. Costa Rica has a relatively enlightened government who recognized this, and developed a program to bring back the crocs. First they reimbursed farmers for lost livestock. More importantly, they implemented a school program where students hatched baby crocs and took care of them for some time before releasing them into the wild. The kids developed bonds with the baby crocs, so that when papa pulled out his gun after a calf got devoured, the kids would say, “NO! That might be my baby crocodile!” We care about our children. We listen to them. In this way, they can be some of the most important messengers amongst us. The overall conference focused on the argument advanced by many environmental experts that Earth has entered a new geological epoch, the Anthropocene, or “the recent age of humans.” Proponents of this theory contend that humans have become a global geophysical force capable of disrupting the grand cycles of biology, chemistry and geology by which elements like carbon and nitrogen circulate between land, sea and atmosphere. This is resulting in profound alteration of the planet’s climate, serious threats to a large array of species and critical ecosystems and conversion of fertile lands to desert. Message in a Bottle pieces created in a workshop facilitated by Kristen Heeres at Holm Elementary, Denver. This work won an award from the Colorado State Governor’s office for innovative arts programs. Plastic debris in our oceans and on land is a global problem. This problem did not exist a decade ago nor did it exist before in the history of our planet. This plastic waste has become “the ghosts of our consumption.” In conjunction to studying animals in Ms. Felix’s grade class, the students worked in art to show the affects plastic waste has on these animals and their habitat and give them a voice that will rise up and let the world’s love of animals and the earth motivate change. The students understood through their research and lessons that science tells us how something really is and how it works but does not express how one feels. Through this work, they have created a synergy between art and science. The students began this study by exploring how plastic waste begins from storm drains, gyres in the ocean to daily littering. They understood that although some of the littering is not accidental, many people are unaware of the affects it plays in nature and others may think the world is so big a little trash wouldn’t hurt. The students know it is their job to speak for the animals and their world and educate others to on how to keep the earth clean. The students explored their own school grounds and gathered bags of trash some of which they recycled or disposed of and other trash was cleaned and selected to adorn their artwork with. Each of their animals has debris on them but used it in a way to express a need for change. Upon finishing their animals the students each created an inkblot landscape to place their animals on to exemplify the permanency of this global problem if actions are not taken by all members of our society to stop this problem. The paper mache tree is an emblem of growth and can be added to over time by other classes or groups around the world. The branches reach out to our world with messages of hope and awareness. The leaves were an oil and water experiment we conducted to show the affects an oil spill has on animals and their habitat. Lastly, the students photographed their work and used a gel medium to transfer their images on to foam so their work could be more mobile and allow room for others to join in their efforts. In this installation, art and young hands will play a role in making all aware of this global problem through visual voices. Kristen Heeres led her students through a process of collecting plastic litter around the schoolyard and collaging the plastic into a printmaking technique. This allowed the students to tune into the trash present into their own spheres. The animals that inspired these works came from a study of local river ecologies. Are you afraid of ghosts? This installation should really scare you because it reflects the “ghosts of our consumption” that are lurking in every corner and on every shore around the globe. Instead of collecting seashells on the shore, you can collect vibrant sun-bleached and patina-worn plastic. Plastic pollution is a growing problem that must be stopped and awareness through love is the students’ mission. The second graders set forth as scientists and studied these animals. They learned about where they live, what they eat and more. As artists they explored how an animal is affected by this global problem and created a work of art to express a “Message in a Bottle” that shows how these animals truly feel and are affected by plastic waste. Their intent is to “nudge” others with these works of art and motivate a “LOVE” that will promote change. This problem DID NOT exist a generation ago but now this generation wants to make a change for their future and the future of our sea life, wildlife and majestic lands around the world. Help them in their efforts by educating one another about the importance of reducing, reusing and recycling! 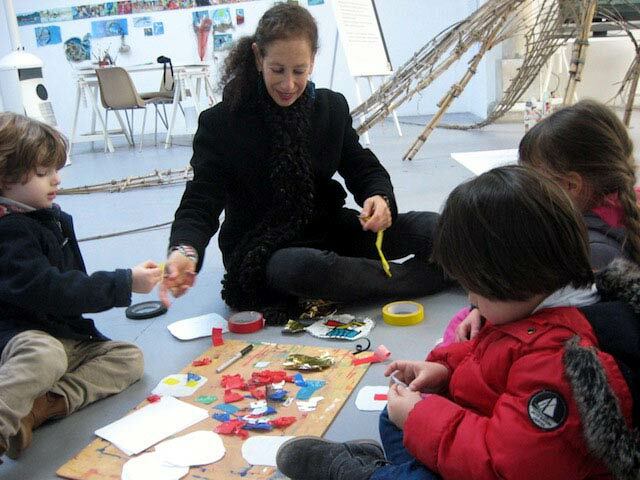 In 2012, La Napoule Art Foundation offered a residency for artists to create work specifically for a young audience in mind. As a new mom, I was moved to create work about environmental issues my son will face in his lifetime. Plastic, the chemicals that make up the material, as well as the chemicals used in industrial agriculture became of primary concern since I started feeding him his first foods. The intentions expressed in the proposal below became the foundation for the Debris Project. Through the myriad of perspectives of age and place, I would like to explore a single material which transcends our differences and has a tremendous impact on all of us; Plastic. Plastic is one of the most important materials in our lives. We simply do not have the natural resources to support our population without it. However, single use plastics are wreaking havoc on both our health and the environment. It is made from a limited resource, it does not cycle back into the environment which creates an inordinate amount of waste and damage to wildlife, and the chemicals which make up plastic are now linked to some of our biggest health concerns today. Children are often interested in issues that affect their health and the planet they will inherit. It is important to engage them on pertinent issues so that they may take ownership of their future. They also demonstrate a strong interest in having an impact on the world while they are still young. We can be inspired by the idealism of youth in solving pressing problems. Art is a fantastic platform on which to explore creative ideas and solutions to problems which affect us all. Because Plastic fills our lives, it is a very familiar material which is often taken for granted. I aspire to encourage children to consider this very common material in new ways. I would like to present work which explores both the environmental importance of plastic which endures in a useful form, and contrast it to the environmental catastrophe of single use plastics. It takes a lot of effort to pay attention to how we use the most common materials in our lives. It is important to encourage youth to start paying attention to our daily actions to encourage their understanding of our places in context of the world in which we live. In doing so, they may feel empowered to incorporate small changes in their own lives which would inspire waves of change in the larger spheres of their communities. 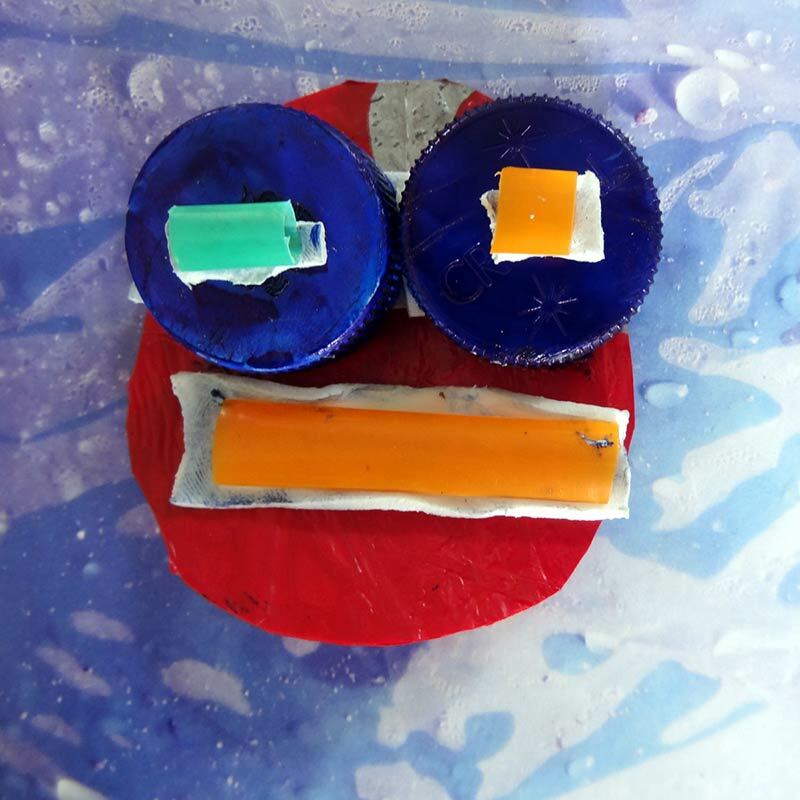 As a compliment to the work that I create which would encourage a reconsideration of this common but untraditional material, I would like to design an interactive element where children could build their own art works from found plastic objects that would otherwise be laid to waste. In the hopes that it would inspire a long term ability to repurpose materials, I hope that it offers a shift in perception as to the value of materials that are often overlooked. Beyond the scope of this particular residency, I would like to take the interactive element into various schools and communities at home and abroad in order to engage children on the subject of plastic. I plan to build an online presence with the work and reflections created by the kids to form a foundation of a visual dialogue around this material which touches us all.